A concept that balances large-scale installations of low-cost and low-power antennas to boost cellular coverage in difficult environments will also provide better connectivity to more users. Developed by A*STAR, this new architecture for wireless communications can help service providers meet growing demands for increased network capacity and improved energy efficiency. Jingon Joung, Yeow Chia and Sumei Sun from the A*STAR Institute for Infocomm Research in Singapore sought to combine two state-of-the-art wireless technologies into a novel type of antenna system. 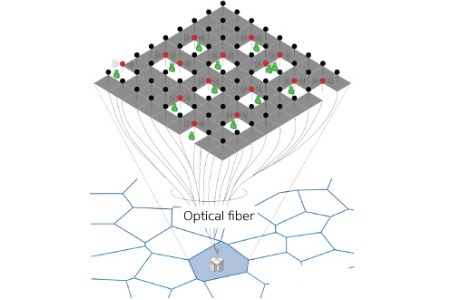 The first technology, known as large-scale multiple-input multiple-output (L-MIMO), uses numerous ‘co-located’ antennas to significantly reduce relative noise levels inside devices. The second, called distributed-antenna systems (DAS), replaces conventional high-power antennas with strategically placed compact nodes that can split up and transmit signals more efficiently due to improved line-of-sight pathways. The team’s strategy, known as large-scale distributed-antenna systems (L-DAS), seeks to implement DAS with a massive installation base, as seen with MIMO antennas (see image). To realize this goal, however, required a way to evaluate the costs and benefits associated with this innovative infrastructure — simply increasing the number of antenna nodes does not automatically improve wireless network efficiency. Using a complex computer simulator, the researchers quantified the performances of multi-user L-DAS networks by evaluating their energy efficiencies (that is, the number of bits decoded per joule). According to Joung, modeling energy efficiency is challenging because L-DAS antennas communicate in two ways — wirelessly or through fiber-optic cables — and each channel has different and often proprietary power requirements. At first glance, the original ‘naive’ L-DAS setup seemed to have a greater energy consumption than the L-MIMO system with co-located antennas. However, the team identified four key attributes that could dramatically enhance the L-DAS energy efficiency: proper antenna selection, clustering of antennas, pre-coding to improve channel quality, and computerized power control. With these improvements, the L-DAS network outperformed both L-MIMO and DAS technologies. The A*STAR-affiliated researchers contributing to this research are from the Institute for Infocomm Research.